The simple answer to this question really involves acknowledging how the fall of man has caused even Christians to pursue a system of labeling themselves to the point of sectarianism and exclusionary tendencies. Inherent within our sin nature is an urge to puff ourselves up as having the "only correct interpretation." Some denominationalism arises from a desire to distinguish ourselves according to a certain heritage such as the African American civil rights movement or some other significant historical event that drove people to their faith, but most denominations came about in an attempt to distinguish a certain doctrinal position that a certain church held to. The primary issue with denominationalism is not that different church communities have a different interpretation of the "negotiable doctrines," it's that we tend to slap labels on ourselves which can lead to sectarian divisiveness and lack of overall unity in the body of Christ. The true Church is made up of all believers in Christ across the world, no matter what denomination they are in. Let's take a look at the history of how denominations came about. Between 33-60 AD the New Testament church began to be established. This church was based upon the doctrines of the early Apostles and Prophets of the Bible (Eph. 2:20). Relative harmony existed within the New Testament church until about 125 AD when the "gnostics" began to introduce heresy into the church. Only a few other "splinter groups" attempted to infect the early church with false doctrines to no avail until the time between 300 and 400 AD when a major societal shift regarding the church happened. In the early 300's the Roman emperor Constantine issued an edict that ended hundreds of years of violent Christian persecution in the Roman empire, this resulted in a period of favorable relations between the Church and the governing Roman officials. As the times progressed an official meeting between church elders and Roman officials commenced in 325 AD called the "council of Nicaea." This basically reorganized the early church model into was was known as the Catholic Church. So here we find the introduction of the first denomination of Christian history, we can see that the New Testament church experienced a "break-off" into which the "Roman Catholic denomination" came into being. Over the next 700 years Christianity was made up of those who considered themselves non-Catholic and those who were part of the Catholic denomination. One could argue that the "non-Catholics" perpetuated the continuance of the Early Church as the Catholic church began to institute rituals and traditions which are alien to that which was practiced by the early church in the Bible. At around 1054 AD an event called "the great schism" happened which basically split the Catholic denomination between East and West. Out of this "great schism" the second major denomination in Christianity came into formation, the "Greek Orthodox church." This split had to do primarily with an objection to the authority of the Pope in the Eastern church, however it did result in creating a denomination that held several differences in doctrine to that of the Catholic church. So by 1054 AD we had 2 denominations, the Catholic and Greek Orthodox, and then we had those who claimed to adhere only to the teachings of the New Testament regarding faith and conduct (non-Catholic/Greek Orthodox Christians). This was the basic landscape of Christianity all the way until the 1500's when the 4 major "protestant" denominations came into existence. The word "protestant" basically refers to groups that decided to engage in "protest" against the Catholic church in the 1500's. One of the first protestant movements was called the "anabaptist movement" in about 1521 AD. It basically was a movement that took issue with the Catholic doctrine of infant baptism and argued that one must make a personal decision to follow Christ before being baptized. Around the same time a German monk named Martin Luther began what many historians call "the great reformation" when he published his 95 theses against the Catholic church in 1517 AD. This led to the founding of the Lutheran church in about 1526 AD. Two additional "protestant" denominations began in the mid-1500's called Anglicanism and Calvinism. Anglicanism began when the King of England (Henry VIII) was prohibited from divorcing his wife by the Catholic church. He then decided to break away in protest to this, and thus created the Anglican church otherwise known as "the Church of England." Calvinism began when a French theologian named John Calvin wrote his book "The Institutes of the Christian Religion." In Calvin's writings he built upon many of the teachings of Saint Augustine of Hippo and Martin Luther regarding justification by faith alone. Calvin also became well known by his teachings regarding predestination and divine election. So by the end of the 1500's we find six major denominations at work: Roman Catholic, Greek Orthodox, Anabaptist, Lutheran, Anglican, and Calvinist. From these six major denominations we essentially derive all other denominations that we have today. Roman Catholic and Greek Orthodox churches still have their respective houses of worship with only a few minor factions within. From the Anabaptists came the Mennonites, Amish, the 7 day Adventist churches, and all Baptist denominations,. From the Lutherans we find a couple of different branches which all wear the Lutheran label. The Anglicans remain fairly firm in their structure to this day, the Episcopal church is basically the American version of the Anglican tradition, which was created after the American revolution. In the 1700's an Anglican minister named John Wesley reportedly experienced a deep religious conversion which eventually led to his leaving the Anglican denomination and beginning the Methodist movement. From this came all modern Methodist, Wesleyan, Pentecostal, and Charismatic denominations. And finally from Calvinism came all of the Presbyterian and "Reformed" churches that we see today. The reason we have so many branches of the 6 major denominations that existed in the 1500's is due to several factors. Sometimes regional locations cause different branches to happen, for example the Northern and Southern Baptist conventions. Most often the differences boil down to a difference of interpretation regarding the mode of Baptism, the nature of the Lord's supper, God's way of administering divine election, the process by which God brings about salvation by grace through faith, adherence to a particular confession or creed, contention over the validity or reasoning for infant baptism, and etc. For the most part all major denominations have traditionally affirmed the inspiration of scripture (some liberal branches do not), the diety of Christ, the Trinity of God, and the truth that we must believe in Christ to be saved. What is important is to realize that some branches every denomination can be guilty of violating scripture in their doctrine so we must be very discerning. The pattern that God has called us to follow is not that of any particular denomination. God has called all believers everywhere to study His Word with diligence (2 Tim. 2:15), and to find a church home to worship and fellowship with other believers in (Hebrews 10:25). 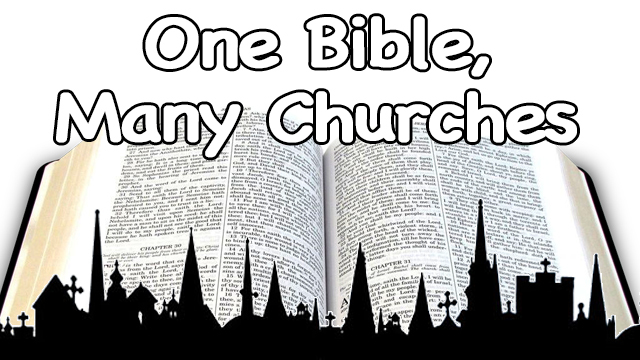 If the church that you attend continually teaches something that violates an area of scripture that is clearly lined out in God's Word then you may want to begin searching for a church that seeks to be more consistent with the New Testament pattern. There is no perfect church, so as you seek to find a body to connect with ask the Holy Spirit to guide you completely and give you grace and patience for being a member. Many non-denominational churches exist in our day so we are seeing some of the denominationalism beginning to decline. The main thing we must do is show love and respect toward believers in ALL denominations, be apart of a local church, and seek to encourage each other to let God's word guide us above and beyond any man-made creed or confession. God bless. Labels: are denominations bad?, church history, where did all the different churches come from?, which denomination is right?, why are there so many churches?, why are there so many denominations?